San Franciscans have dispelled any doubt that they're willing to pay the price to armor their beloved waterfront against earthquakes and rising waters. Voters approved by more than a 4 to 1 margin a $425 million general obligation bond aimed at strengthening the crumbling Embarcadero seawall, an essential but mostly-invisible retaining structure that holds the city along the waterfront together. Port officials have argued that an earthquake could cause bay mud behind the wall to liquefy and the wall itself to pancake. Sea level rise also threatens more intense storms and rising tides, both of which batter the 3 ½ mile-long piece of infrastructure. The San Francisco Board of Supervisors proposed the bond in May, after port officials found that nearly three-quarters of voters thought fixing the seawall was a good idea. City economists estimate that an earthquake with a 1 percent chance of occurring annually would cause $608 million in business and structural losses. The bond debt will be paid by existing parcel taxes, as older bonds retire. Measure A’s bond will fund most of Phase 1 of the Port of San Francisco’s seawall facelift. 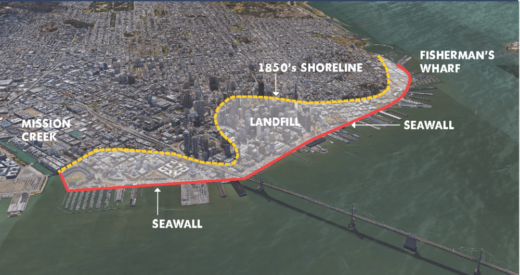 Work planned through 2026 will reduce seismic risk, potentially beginning around the Ferry Building, where some of the oldest sections of the wall are cracking. In the longer term, port officials say protecting the waterfront against earthquakes and sea level rise could take decades, and cost close to $5 billion.